Ads from Comparison Shopping Engines will start appearing in Google Shopping results on September 27, 2017. In response to the European Commission’s antitrust ruling — and record $2.7 billion fine — against Google for favoring its own content, the search giant is making some changes to the way it handles Google Shopping results in the EU. Starting today, Comparison Shopping Engines/Services (CSEs) such as Kelkoo, Shopzilla and Twenga will be able to run product listing ads in Google Shopping results as retailers do so currently. The EC’s ruling required Google to deliver a solution to provide “equal treatment” to CSEs within 90 days or face further penalties. That deadline has now arrived. The EC doesn’t have a specific approval process, but Google believes the changes it’s making put it in compliance with the order. How is the auction changing? The biggest change isn’t in how the results are displayed but in who competes in the auction. CSE’s will compete in the auction against each other — and against Google Shopping. As was previously reported, Google Shopping will operate as a separate business unit with a separate team in the EU that will be responsible for its own operating budget. It must operate profitably and will be reviewed regularly by the Commission to ensure the unit is competing on equal terms. All of the ad slots will be available to all bidders; no ad slots are reserved for either Google Shopping or CSEs. This brings up several questions about how this will actually play out for merchants now that Google Shopping and the CSEs are in effect bidding on their behalf. A good percentage of merchants are likely participating in Google Shopping and at least one or more CSE. The visibility in Google Shopping will now depend, not just on the merchant’s own bid and quality metrics, but on how well it performs for Google Shopping and the CSEs for a given query. Google’s bids will have to make sense for it as a marketer, just as they do for CSEs. How this new bidding dynamic will affect merchants’ own bidding strategies will be interesting to watch. We have learned that there are controls in place to keep merchants that are running ads through Google Shopping and through participating CSEs from bidding against themselves for a given query. 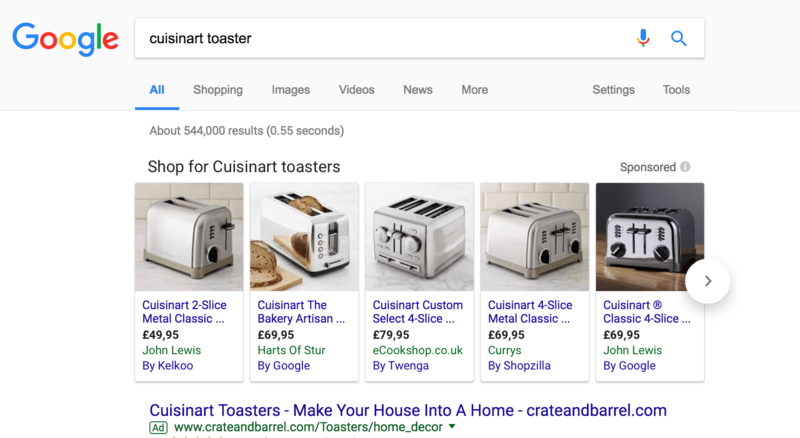 How are the Shopping ad results changing? It only affects results in EU countries where Google Shopping is available: Austria, Belgium, Czech Republic, Denmark, France, Italy, Ireland, the Netherlands, Norway, Poland, Portugal, Spain, Sweden, Switzerland and the United Kingdom. Google is continuing its appeal of the EC ruling. That appeal process could take years.